Any machine needs to be protected and maintained at regular intervals, so that it can be produced more smoothly. There are also many types of foam granulators, such as a one-piece foam granulator, a split foam granulator, a large foam granulator, and the like. However, their protection and conservation methods are the same. In order to ensure that the granulator equipment is in an outstanding technical state, it can be put into work at any time, reduce the downtime of the granulator, improve the granulator integrity rate, utilization rate, reduce the granulator wear, extend the life of the granulator, and reduce the granulator work. And maintenance costs, to ensure safe production, it is necessary to strengthen the normal protection and maintenance operations of the granulator; to do regular maintenance, forcible, correct handling of the relationship between maintenance and repair, not allowed to use only no maintenance, only repair. Frequent attention to and timely smoothing of the conflicting surface ensures the normal operation of the foam granulator and the service life of the extension equipment. Increase the smooth grease in the bearing housing to 50-70% of the volume. It is necessary to replace it once every three months. Clean the running track of the bearing roller with clean gasoline or kerosene when changing oil. 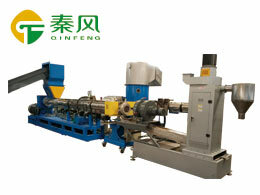 Usually pay attention to observe the operation of the foam granulator and find out the problem in time.